As internet connections get faster and affordable, cloud storages are rapidly replacing physical storage drives. Apart from its benefits of mobility and access from many different devices – even simultaneously, online storage is almost becoming a necessity with major services like WhatsApp using it to back up yout data. If you’re a Google user, you already get 15GB of free storage via Google Drive. But there’s a high chance that you might be already running out of available space, especially if you’re tied apps like Google Photos, Docs, Keep Notes etc. To solve this, Google recently began offering paid Drive storage, just like iCloud, to consumers under the banner of Google One. 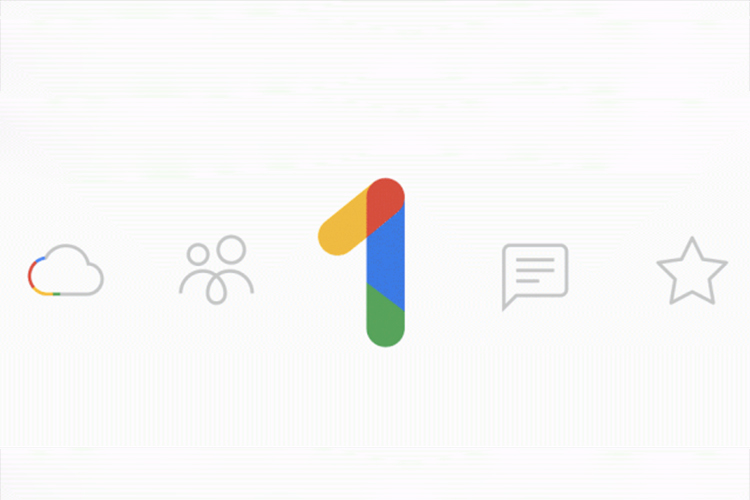 Back in September, Google announced that Google One would be coming to India soon and a month later, those using paid Google Drive plans in India received an invitation to join the Google One. Over time, the service has been made publically accessible and in order to subscibe, you can start by visiting this link and choose any of the plans starting at Rs 130 per month for 100GB storage to Rs 19,500 per month for 30TB, depending upon your utility. You can also add your family memebers to share this storage. Besides these paid benefits, Google also appears to be offering the basic plan to many of its patrons. 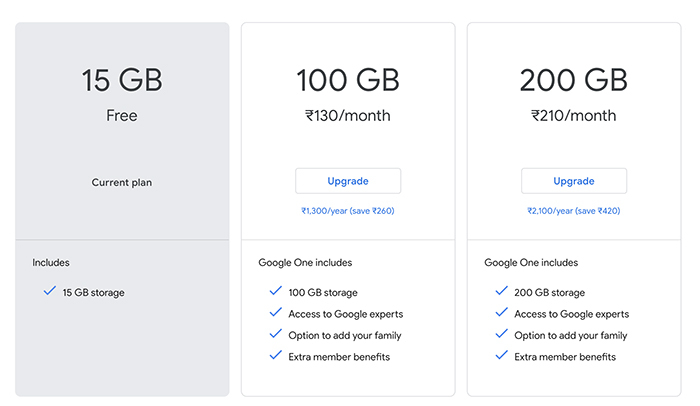 As a reward to its cherished contributors under the Local Guide program, it is offering 100GB of Google One storage for free for a period of six months. This stoarge can be utilized for services such as Google Drive, Gmail, and Google Photos. Further, it can be shared with 5 other Google users. Not only is this a good tactic to promote Local Guide rewards program, it should also attract more users to Google One. Once they cross the threshold of complimentary 15GB, users are more likely to pay for the subscription once the free trial of six months expires instead of freeing up space by willingly letting go of important files. 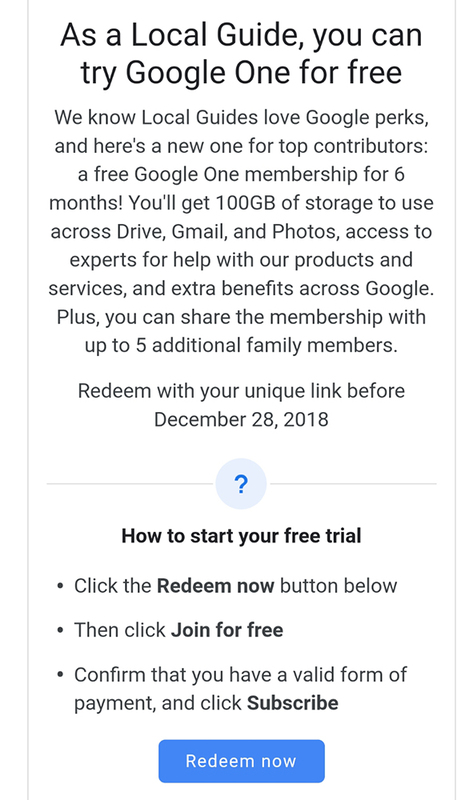 So, if you’re at Local Guide level 5 (that’s what out tipster is at) or above, you are also likely to receive the promotional access to Google One’s 100GB storage. If you haven’t already, dig through your Gmail inbox to see if you are eligible for the offer. Thanks, Veera Brahmaji Vadlapud, for the tip!